Kerry Washington Is The BEST ACTRESS EVER! Forums > General Discussion > Kerry Washington Is The BEST ACTRESS EVER! No one gives a better overwrought speech than Kerry Washington. For anyone watching the final season of Scandal this year you're already familiar with all the jump-into-the-sharks-mouth moments that have made Scandal a classic soap for the ages. If Washington doesn't win the Emmy next year I'll burn down Hollywood personally! Love her, Love the show. She has kinda an odd shaped face (if that makes any sense), but I've always found her very pretty . I hope Kerry finally wins an Emmy for the upcoming final episodes, but we all know better than to hold our breath..
Shes good but I dont know about no best ever...in your opinion but we have TOO MANY out there deserving of that title as well. Loved the episode. Probably was dancing too much to it though. How to Survive a Scandal. That's gonna be fun. As much as I love Kerry Washington the recent major plot hole of a few weeks ago has totally taken me out of the show. How can Roland give up his only trump card (Quinn) by "killing" her and not only remain alive, but get his bones back as well? I'll watch until the end because I've invested so much time but that one is just unforgiveable. Streep the best to ever do it. Maybe it's the deeper love/hate issues of the parent/child relationship. Given that speech Rowan gave Quinn while holding her baby made it a deep inner core thing. Olivia and Papa Pope's relationship is definitely unique and not so unique. She's really good at feigning concern, confidence, and has a great my favorite pet just died face. I think that makes her the black Reese Witherspoon. Best actress ever? Naw, but it's a living! Philosophers and linguists alike have long debated the intricacies of language, how we construct meaning, and how stationary those meanings really are. You've probably heard the line, 'That which we call a rose by any other name would smell as sweet.' Shakespeare asserts here then that a name doesn't matter - it's what that thing or concept really is. Even if we ceased to call a rose a rose, we could still smell its fragrance, feel its velvety petals, and be pricked by its thorns. You can see from the picture above the mental image I had when I read the word 'rose.' Human communication would become extremely tricky if we all associated completely different meanings with a given vocabulary word. If you said 'mango' when I saw a rose, and we were trying to describe the same thing, you can see where we'd have a problem. Semantics means the meaning and interpretation of words, signs, and sentence structure. Semantics largely determine our reading comprehension, how we understand others, and even what decisions we make as a result of our interpretations. 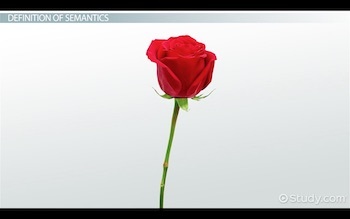 Semantics can also refer to the branch of study within linguistics that deals with language and how we understand meaning. This has been a particularly interesting field for philosophers as they debate the essence of meaning, how we build meaning, how we share meaning with others, and how meaning changes over time. One of the central issues with semantics is the distinction between literal meaning and figurative meaning. With literal meaning, we take concepts at face value. For example, if we said, 'Fall began with the turning of the leaves,' we would mean that the season began to change when the leaves turned colors. Figurative meaning utilizes similes and metaphors to represent meaning and convey greater emotion. For example, 'I'm as hungry as a bear' would be a simile and a comparison to show a great need for sustenance. I had never heard of Scandalous prior to this thread...and I've been marathoning it ever since ! Damn, I have a thing for political shows, but a political soap opera? Didn't see that one coming. Fun show. Just started season 5. Good to see Guillermo Diaz, too. Haven't run across him since Weeds. How To Survive A Scandal, was yummy.